Serifos is relatively close to Athens and is connected through Piraeus with at least two ferries, during summer. Depending on your preferences you can find cheap tickets taking the regular ferries or a bit more expensive if you take the high-speed ferries that serve the route. Apart from Piraeus, Serifos is connected to Athens through the port of Lavrion. From Serifos you can go to a bunch of Greek islands with direct ferry routes i.e. Andros, Mykonos, Paros, Naxos, Amorgos, Kea, Kimolos, Koufonisia etc. Due to the frequent timetables during summer, Serifos is a good island to have as a base for island-hopping in the Western Cyclades. I have been visiting Serifos for the last five years and I have never got bored, as it is quite a unique island combining nice beaches, warm locals and a nice but calm nightlife! All the times we have stayed at Camping Coralli as it is quite convenient in terms of location (it is near Livadi) and the beauty of the adjacent beach, which is one of the most popular among the beaches of the island. Serifos has magnificent beaches around the island, most of them reachable with a car or public transport. In fact, there is no need to have your own car as the public bus in combination with some walking around can meet most of your needs for beach, food and drink! The life of the island is separated in two places; the port (Livadi) and the town (Chora). Livadi is a bit more "touristic" with several rooms-to-let and tavernas. 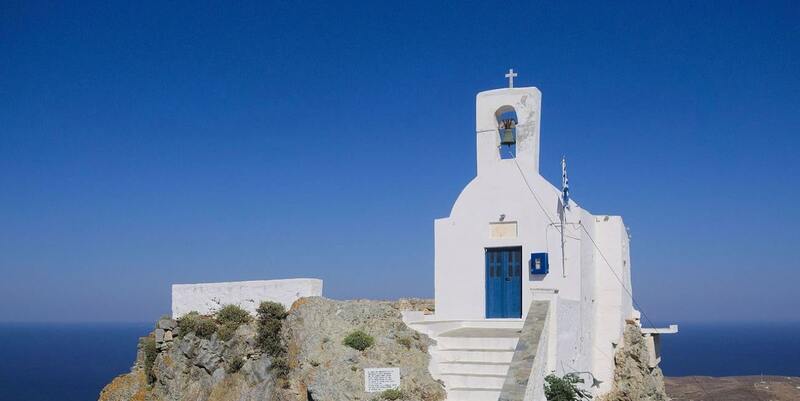 Chora is one of the most beautiful villages of the Cyclades. It is located up to the hill and from its old castle you can have a breathtaking view of the Aegean Sea. In Chora, you can taste typical Greek cuisine and enjoy nice cocktails with a refreshing summer breeze. To sum up, Serifos is a perfect island to spend your vacations! Either single or with your couple, you have the opportunities to have a great time!